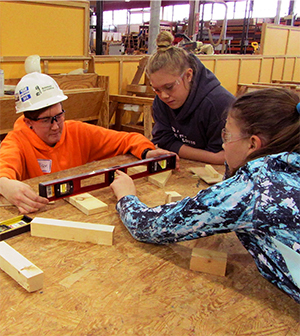 Thirty-five girls will have the opportunity on April 21 to saw, hammer, pound nails and eat pizza with construction trades women. The event, will be held at the Nelson-Mulligan Carpenters Training Center at 8300 Valcour Ave. in Affton from 8 a.m. to 1 p.m. Participants will learn how to use a hammer, drill, hand saw and level and will be taught specific skills by union craftswomen in closely monitored work stations. The girls will be building a wooden step stool they can take home. While past workshops were held to help Girl Scouts earn their Woodworking badge, this workshop is being offered to all girls ages 8 through 18. “Realizing that not all girls are able to participate in the Girl Scouts, the workshop is open to all girls to give them the opportunity to learn the skills and introduce them to a trade they otherwise might not have considered,” said Lynda Mueller-Drendel, an instructor at the training center who’s organizing the workshop. Organizations assisting in the workshop include the Carpenters Joint Apprenticeship Program; Sisters in the Brotherhood; National Association of Women in Construction; and Missouri Women in Trades. There are currently 22 tradeswomen who will be assisting the girls, but Mueller-Drendel said she could use more. To volunteer to help or for more information, contact her at ldrendel@cjtf.org, telephone 314.210.1089.